Back to school is the perfect time to get into a healthy routine. Protein packed breakfasts are key to getting through a hectic schedule, according to entrepreneur, television host, and co owner of BIRD Bakery, Elizabeth Chambers, who makes her own granola. Elizabeth’s granola is made with olive oil instead of butter and honey in place of sugar, which makes for a perfect guilt free breakfast that keeps adults and kids happy on the go. It also makes for a great snack, ice cream topping or yogurt mix in. Whether sprinkled on top of your favorite ice cream or combined with yogurt and fruit for a balanced breakfast, this granola is the perfect combination of salty and sweet. Guests order jars of it by the case, because it's so uniquely different. Brown sugar replaces white sugar and olive oil is used in place of butter to create a light crunch that makes it nearly impossible to resist. You can try making your own with her recipe, or visit her in San Antonio! Spread onto sheets evenly. Bake until golden, about 20-25 minutes, rotating pan once at 10 minutes. Cool at room temperature. 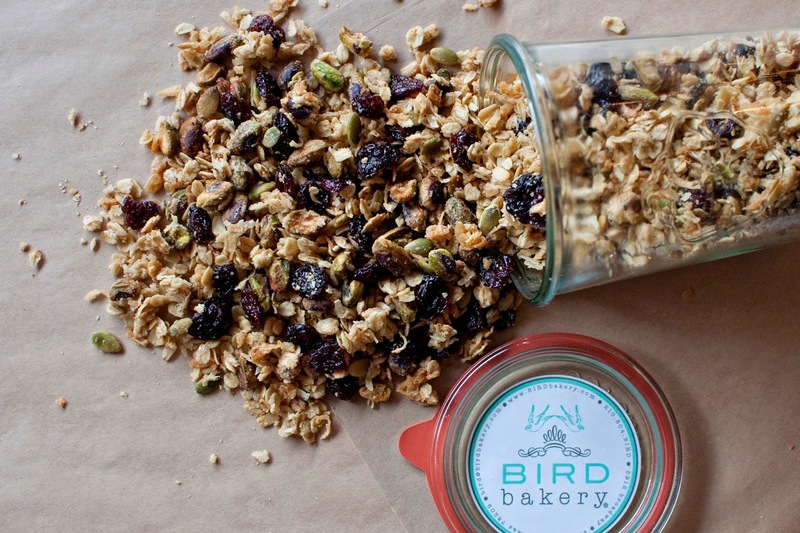 Break up granola; sprinkle with dried cherries. store in an airtight container. Enjoy!